A leak resistant steel lunch box with a removable silicone seal. 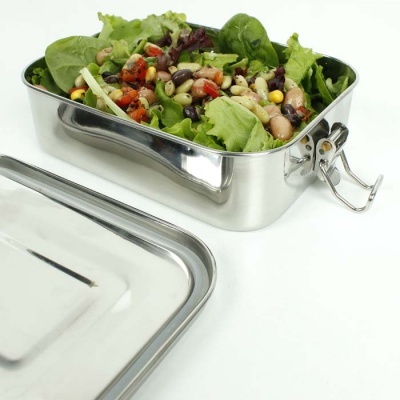 Ideal for taking a waste free 'on-the-go' balanced lunch from home, this rectangular stainless steel lunch box has a handy silicone seal around the lid which means it more leak resistant than the standard A Slice of Green containers. It also has levered locking clips at each end for extra pressure during closure. 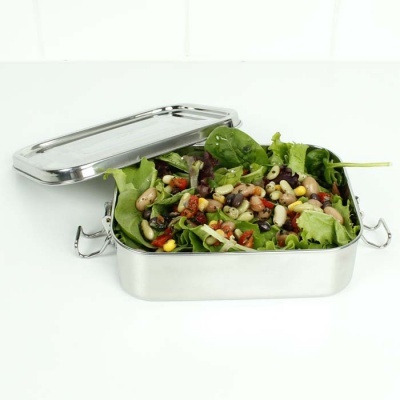 Please note that although this container is suitable for wetter foods such as dressed salad or dips it is not suitable for liquid foods such as soups and broths. We recommend a screw top food jar for liquid foods. Not for use in microwave. Dishwasher safe. Silicone seal is removeable and can be washed separately, then reinserted. Internal Dimensions: 4cm x 15.8cm x 12.3cm. 650ml capacity.